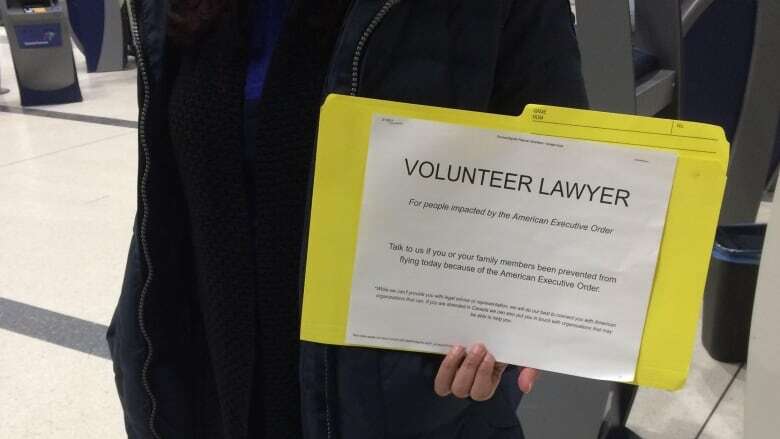 A number of Canadian lawyers have been volunteering their time at airports to help those affected by U.S. President Donald Trump's travel ban. 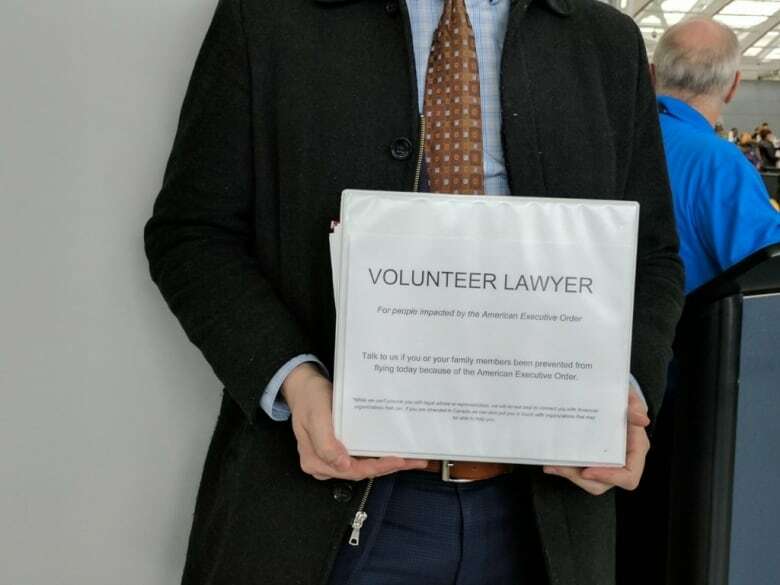 In Toronto, hundreds of lawyers have been helping anyone who gets turned away at U.S. security checkpoints inside Pearson International Airport. Corey Shefman, a Toronto-based Indigenous rights lawyer, said there have been volunteer lawyers at Terminal 1 and Terminal 3. He was at Pearson this past week, but declined to have his face shown in photos. "People are glad to see us offering our help. They're concerned about the ban." On Friday, a judge in Washington State froze the ban, which affects people from seven Muslim majority countries. The Trump administration moved Saturday night to appeal the judge's decision in a bid to have the ban reinstated, but that request was denied by a federal appeals court Sunday morning. In the meantime, people from the seven countries affected can travel to the U.S.
Jennifer Bond of the Refugee Hub, one of the groups behind the effort to make the legal aid available, says lawyers will be on hand also at Montreal's Pierre-Elliott Trudeau Airport, Vancouver International Airport, and Ottawa's Macdonald-Cartier International Airport. She said the lawyers want to ensure travellers' human rights are protected. The group is part of a larger movement that started in the U.S. last week when lawyers descended on airports following the travel ban. Trump's immigration order barred people from seven majority Muslim countries — Iran, Iraq, Syria, Yemen, Sudan, Libya and Somalia — from entering the U.S. for 90 days. The executive order also suspended new refugee admissions for 120 days. The Trump administration has said it issued the ban because it believes safeguards against violent extremists entering the country are inadequate and it will use the time to strengthen the vetting process. "We really don't know what Trump is going to do next. We need to be prepared to assist people if the situation changes. As lawyers, we have a responsibility to work for justice and stand up for people who can't stand up for themselves." The lawyers declined to say how many people they have helped at Pearson. They said they want to keep the total numbers private for security reasons. According to U.S. Customs and Border Protection agency, 1,136 fell into the "Recommended Denial of Boarding" category since February 1. The U.S. agency wasn't able to say how many people were denied entry from Canadian airports because it said those numbers were not yet available. Prime Minister Justin Trudeau said shortly after the ban was implemented that Canadians with dual citizenship from one of the banned countries could travel freely to the U.S.
​And some major Canadian airlines say they are returning to business as it was prior to the ban. Shefman said, however, there are still a lot of unknowns about the ban. "There's a lack of information. There's a lot of confusion. That's one of the things we're going to be working on," he said. He said that even though they can't practise law in the U.S., Canadian lawyers are gathering information to help build a potential case against the executive order. "We want to assist our colleagues in the United States." Shefman said the group will recommend U.S. lawyers to those who need them.